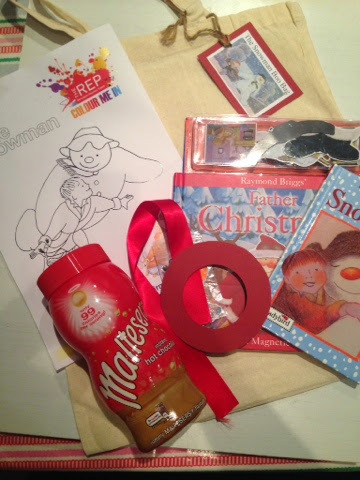 Here's our 'The Snowman' themed Boo bag, I got the inspiration for these smaller versions of our Boo boxes from Vicky over at singlemotherahoy.com Vicky's nursery gave her daughter 2 bags to take home for the holidays, they included printables from Twinkl, a book and toy to go with the theme. I loved them! I purchased these calico bags way back never knowing what to do with them! I did think about putting a transfer on them, but realised that it was silly to do this and a tag is far more practical and re-usable. 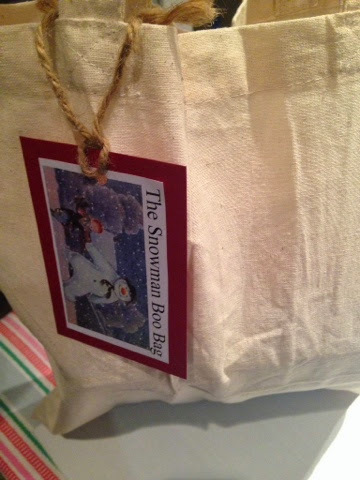 I created a tag for our bag and filled it with goodies, enough goodies for a good afternoon's worth of play. We started off with making the snowman. 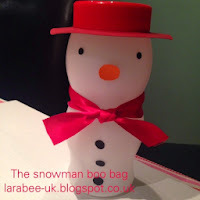 If you remove the plastic wrap from a maltesers or galaxy hot chocolate jar, it looks just like a snowman, I've been thinking this since about March this year and waiting all year long to make this craft - that's really difficult when it's 100% your own as you want to shout all about it, believe me! Anyway, back to the project. 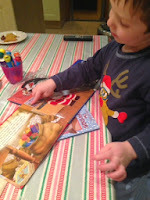 I'd already cut out all the little bits, hat and ribbon, so all T had to do was to assemble with a little help. As you can see, he did a sterling job! 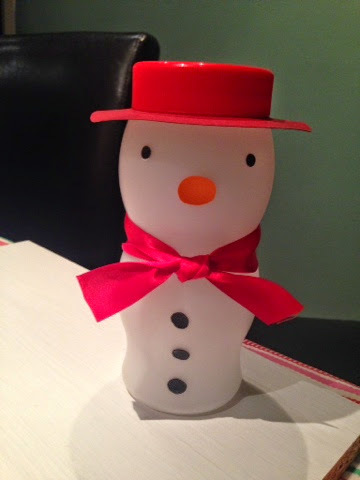 We plan to fill our snowman with chocolates, this is something which would be really easy to make as a teacher gift and we may even make some for T's nursery keyworkers. After our snowman was made, we did some colouring and finished with both stories. I really liked having a bag to bring out when T needed a little chillout time and it definitely was a nice transition into the evening. I'm considering creating a couple just to keep when he needs some time to sit and relax instead of running around like something possessed! 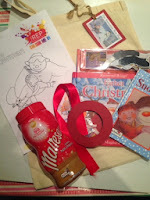 I hope you liked our little Boo bag, we've got a 'Polar Express' themed post coming up soon, which I'm really enjoying putting together! The snowman looks ace! 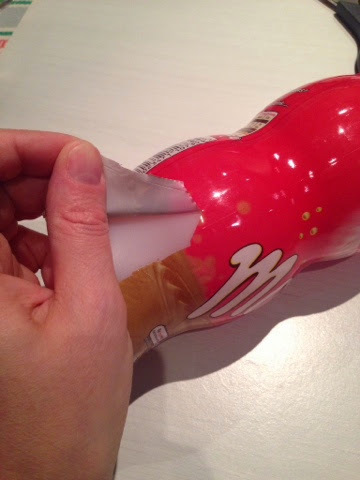 What a great idea. It's good to see lots of recycling too.